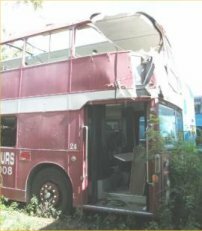 Alex tracked the VR down to the yard of Miami Double Deck Tours in February 2004. Clearly identified by its reversed layout it has received substantial damage to its roof in a collision (Alex Hall). 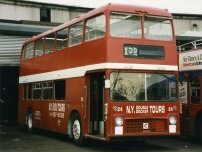 Next stop was New York in the fleet of Double Deck Tours where it was unique amongst the Lodekkas and VRs as a left-hand drive conversion (Bob Martin). Seen here in Chisholm during June 1986, when on loan to Iron Country Bus Lines. 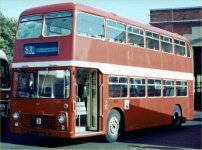 Note how similar the livery is to that carried by LRN57J - likely these were the fleet colours for Rochester City Lines. Note also the neat left-hand drive conversion with the reversed entrance on the offside (David Hunt). Seen here when relatively new (and in right-hand drive configuration) with Midland General. NBC red livery was applied during its time with Trent.